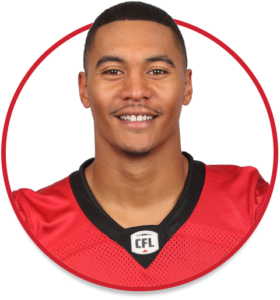 Long originally signed with the Stampeders on Oct. 3, 2018, and spent four weeks on the practice roster before being released. He was signed as undrafted free agent by the National Football League’s Seattle Seahawks on May 4, 2018. He was waived on Aug. 12, 2018. Long signed with the New York Giants on Aug. 20, 2018, and was released on Sept. 1, 2018. (Calgary) Long signed with the Stampeders on Oct. 3 and spent the next four weeks on the practice roster. Long played his first three seasons (2013-15) at Northwestern as a running back, carrying the ball 105 times for 517 yards and five touchdowns. He suffered an injury during his first game of the 2016 season and was redshirted. Long returned for his senior season in 2017 and was converted to linebacker, making 21 total tackles and adding one sack and two forced fumbles. Long is an alumnus of James Logan High School in Union City, Calif. He competed in football and track at James Logan and was also on the honour roll. At Northwestern, he was a member of the academic all-Big Ten team in 2016.